During the last few months, the club has had discussions and meetings with senior officers at Thurrock Council on our plans to relocate our club back to Grays. We have found the Council very proactive and helpful in understanding our plans to have a community sports facility to cater for our senior players, youth players - boys and girls - our veterans' team and our walking football teams - covering players from age five to seventy-five with a range of abilities. We also intend to develop a football academy to include post sixteen-year-old academic and sports studies. The Council is developing its new local plan and we have made our intentions known and hope land will be allocated for a community stadium, ancillary pitches, buildings and car parking. Councillor Rob Gledhill, Leader of the Council said ‘we are working with Grays Athletic Football Club to ensure they are able to thrive as Thurrock expands and I want to see all sport succeed here in the borough as far as possible’. There will be opportunities for our supporters to put forward their views on the Council’s new local plan and we hope they will be able to take part in these consultations and support our proposals for community football provision in Grays. William Edwards School have met with the Department of Education to determine the programme for the new development and have also met with the Thurrock Council planning department. Grays Athletic Football Club welcome the recent confirmation that the South West Essex Community Education Trust's (SWECET) application to build a new free school has been approved. We would like to pass on our congratulations to all involved and wish the Trust all the very best with the development of Orsett Heath Academy. We are sure that this new facility will be a fantastic new asset to the community. As documented in the SWECET brochure that explained their proposal, the possibility of Grays Athletic Football Club being part of the development at the proposed site, as part of a sports hub, has been discussed with the Local Authority and SWECET. Following this significant announcement from Government, the Club looks forward to meeting with the key people involved after the Easter break to further those discussions. ''The school’s application for the new school will be submitted this month. There will be an interview with the Department for Education in January 2017 and a decision on the funding for the new school will be made in March 2017. If it is approved, it is planned to open the new school on council owned land east of Blackshots in September 2019. It could also lead to the relocation of Grays Athletic Football Club on part of the land as an important part of the “Blackshots Sports Hub”. The Trust, which also oversees William Edwards School, continues to talk with the Local Authority about the possibility of bringing Grays Athletic Football Club back into Grays as part of the sporting hub element of the project. Grays Athletic Football Club strongly supports the Trust’s application and we look forward to working with them to develop the concept of a sporting hub for Thurrock, including the Football Club. Speaking about the proposals Andy Swallow said "since stepping back from the day to day running of the club towards the end of last season, I have been working hard to fullfill my commitment to return the club back to Grays, this announcement is very welcome and I will continue to work with the School and council to make this proposal a reality and return the club back where it belongs at the heart of the community in Grays"
The club would like to let our supporters know that talks are ongoing with our partners for the new Grays Athletic community stadium. Meetings have been held with our potential partners and members of the club have met with the head of the Thurrock council planning department and his planners. Due to various reason we are still unable to give any details of the new stadium. We are in the early stages of planning, but we can say that we are all very excited by the possibilities that have so far been discussed with our partners and with the council, who very much want to see us return to Grays. We are sorry we cannot give you any more information at this stage, but please know that we are working hard to return the Blues back to Grays. Representatives from Grays Athletic met with Thurrock Council this morning with the Head of Planning and three of his senior colleagues. It was a positive meeting and there will be follow ups to put some 'flesh on the bones’ of our proposals. These things take time and with local elections imminent, the club needs to be patient, but there are options to pursue. The Club will keep supporters advised of our plans in due course. The club have funding in place and are now ready to return the Blues back to Grays and build a community stadium. The board of Grays Athletic have taken great heart in the positive response during the YourThurrock hustings debate that was held at the Thameside Theatre on Wednesday evening. Thanks to UKIP's Tim Aker and Labour's Polly Billington there now appears to be the beginnings of some positive talk about the club returning home to Grays . Grays Athletic would like to announce that if Thurrock council can provide suitable land with the relevant planning permission in Grays, the club are ready and are prepared to build a new community stadium and have all the funding in place. This weeks debate has raised the clubs hopes, and if the relevant parties and council are serious and wish to move forward, the club are ready to meet with the Council and are prepared to put forward plans to build a reasonable size community stadium, a stadium that the people of Grays and Thurrock can be proud of and one we can finally call home . It's time now for every Grays Athletic fan to stand up and be counted. 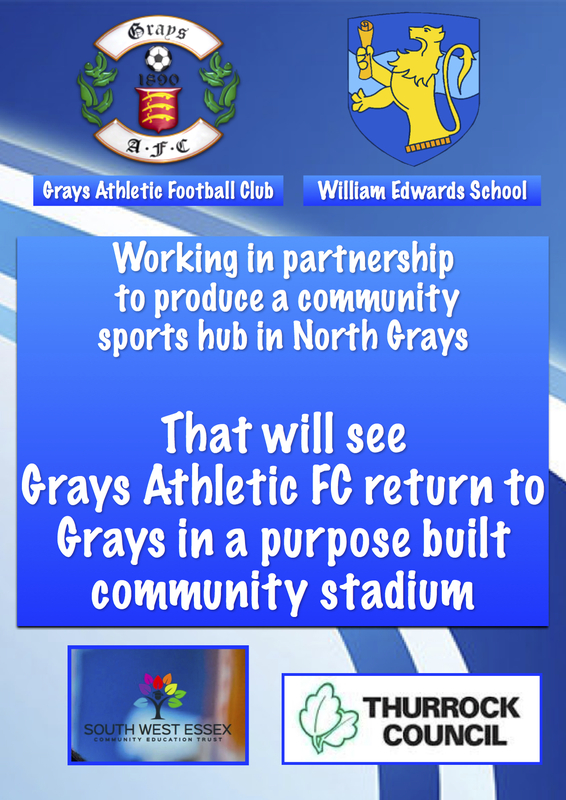 Everyone involved at Grays Athletic are determined to build a community based football club in Grays and the building of a new community stadium will enable the club to build strong ties with the people of Grays and Thurrock as a whole. We are ready to move the club home and we look forward to further discussions with Thurrock council and the relevant councillors. Lets make our dream come true!